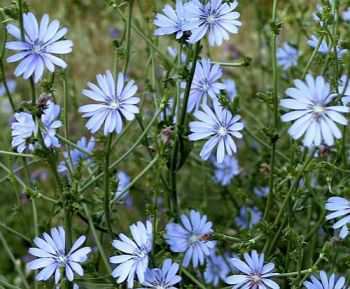 Often people are unaware, the plant with a modest little blue flowers, chosen roadside fields and roadsides, It takes a lot of weed, It is the most famous chicory. wonderful plant, which are useful in the leaves, and roots. It is believed, that the plant came to us from the Mediterranean, but today in the wild is found all over the world, starting with Europe and ending Australia. Because of its use and also cultivated specifically, under commercial cultivation drained the whole field. It turns out, Chicory was used by the ancient Egyptian medical. It was believed, for out of it you can get the antidote for snakebite. Avicenna cured with the help of joints, stomach and ocular diseases. Modern research has noted his wonderful anti-inflammatory, antimicrobials, soothing, vasodilating properties. Since its success apply to treat heart, Kidney and gall bladder, skin diseases, for good hair growth, if you get a headache, or teeth. Very rich in plant vitamins, especially B, There are also reserves of minerals: potassium, sulfur, sodium, phosphorus and iron, manganese. Leaves of salad and ordinary chicory eat, From them prepare delicious soups and salads, as well as side dishes. Chicory root is used for the preparation of delicious drinks and baking. It is useful for diabetics, because its roots contain inulin. This sweet substance used as a substitute for sugar and starch, it contributes to the prevention of diabetes complications. Besides, inulin, contained in the roots of chicory, a positive effect on patients with overweight, helping to reduce it. This is achieved by quickly creating a sense of satiety and reduce appetite. And it improves absorption of nutrients, slag removal, heavy metals, toxins from the body, strengthens the immune system and health, fatigue. But the most famous chicory root yet as a substitute for coffee. Roots after drying and roasting is often added to coffee to enhance its use and improve the taste. For those, who love coffee, but who can not use it due to health problems, either due to pregnancy, you can replace it with a drink from the soluble chicory or a decoction of the root of the ground. To prepare the drink take only high-quality soluble chicory, without any additional chemical additives. A cup of water is usually enough couple of teaspoons of instant chicory. Do not forget, if the drink used for weight loss, the sugar is to be added, drink warm for half an hour before a meal, or even replace them one of the meals. If you use a root powder, then take 2-4 ch.l. on 2 Article. hot water, poured and boiled at low heat minutes 10, insist half an hour and drink slowly throughout the day, best before meals, to blunt the feeling of hunger. 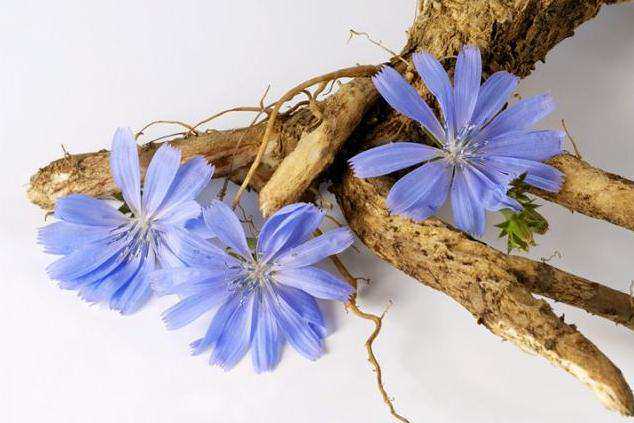 chicory root for consumption must be of high quality, it is better to buy in the drugstore, checking, whether as part of any additives. It is often, especially chicory, prodavaemomu stores, add various plants, eg, briar, lemongrass, flavors, spice, essences, even acorns. Preference Give to a sealed package, because the product is hygroscopic, take it only with a dry spoon. You can try to cook their own root, for this it is cut, podsushivayut, carefully roasted and ground. Be wary of people with unstable mentality, patients with gastritis, as well as children under 3 years old. In spite of the harmlessness of chicory, it is better to consult a doctor about his personal use.